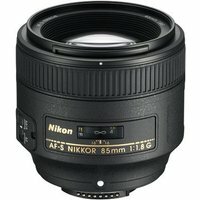 The fast aperture, medium-telephoto Nikon 85mm f1.8 G AF-S is a prime FX lens that delivers incredibly sharp and clear images. It features a Silent Wave Motor, which ensures discreet but accurate autofocus, and a large aperture that allows you to capture photographs with a beautiful bokeh effect in the out-of-focus areas. On a DX-format DSLR, this lens has an apparent 128mm focal length.